The AAMC’s 2018 Report on Residents reveals trends in specialty choices, average test scores, and post-residency professional activities. Here are a few of the most interesting findings. Almost a fifth of those who have recently finished residency go into academic medicine. Most residents complete at least one residency training program in four years. About a quarter of all residents practice in Medically Underserved Areas. 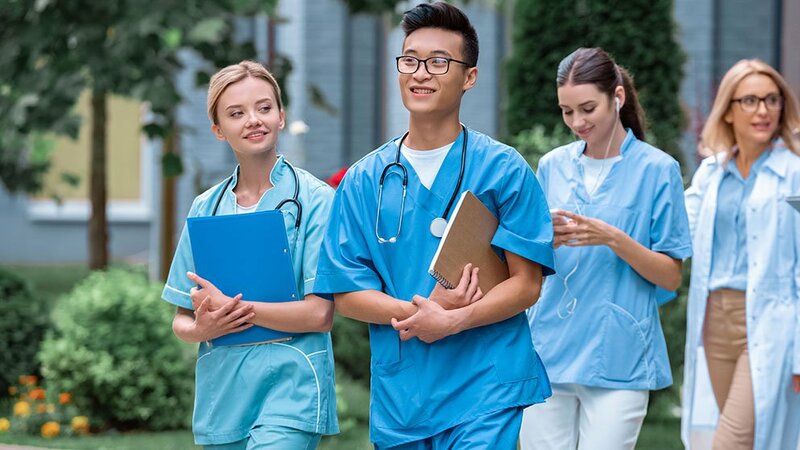 These are just a few of the findings from the 2018 Report on Residents, an annual AAMC compilation of data on the characteristics of medical school graduates and residents, their specialty preferences, and their post-residency professional activities. Over the course of medical school, most students change their preferred residency specialty, with just 25.7% graduating with the same specialty preference they had at the beginning of medical school. Interestingly, graduates who intend to practice in orthopedic surgery and pediatrics are most likely to have cited those same preferences early in their medical school careers: 50.2% of graduates intending to go into orthopedic surgery and 42.9% of graduates who intend to go into pediatrics were interested in those same specialties at the beginning of medical school. Click here to see how specialty preferences change over time. Step 1 test scores of entering residents vary across specialties. For example, the median Step 1 test score for first-year anesthesiology residents was 232, while the scores in the 25th to 75th percentiles ranged from 219 to 243. Similarly, the median Step 1 score for first-year psychiatry residents was 220, with scores in the 25th to 75th percentiles ranging from 207 to 233. For more ranges of USMLE scores, research experiences, and numbers of abstracts, presentations, and publications of residents in 21 specialties, click here. While just 3.4% of all residents are MD-PhD graduates, some specialties have a higher representation of dual-degree recipients, including child neurology (18.9%), radiation oncology (16.5%), and pathology (16.0%). Click here to see which specialties attract a higher proportion of residents with MD-PhDs. Most residents finish at least one residency program within four years of graduating from medical school. In fact, 78.4% completed at least one residency within four years, and 94.0% finished a training program within eight years. Click here for the distribution of graduates by last completed GME specialty. Almost a quarter of residents (23.1%) who completed residency from 2008 through 2017 are practicing in Medically Underserved Areas. The practice varies widely by state, though. Less than 1% (.08%) of those who completed residency and go on to practice in Utah are practicing in a Medically Underserved Area, while 90.6% of residents who completed training and are practicing in Puerto Rico practice in a Medically Underserved Area. Click here for a chart of how many doctors go on to practice in Medically Underserved Areas after completing residency training. While more than half of residents (54.2%) end up practicing in the state in which they did their training, retention rates vary widely from state to state, with a low of 27.2% in Wyoming to a high of 77.7% in California. Click here to see a state-by-state breakdown of physician retention rates. Of those who completed residency training from 2008 through 2017, almost a fifth (18.3%) hold full-time faculty positions at U.S. medical schools. 77.1% of those with full-time faculty positions hold appointments at the assistant professor level. See the breakdown of physicians who go into academic medicine.